Presidential candidate Prabowo Subianto and Vice Presidential candidate Sandiaga Uno . ANTARA FOTO/Aprillio Akbar/pras. 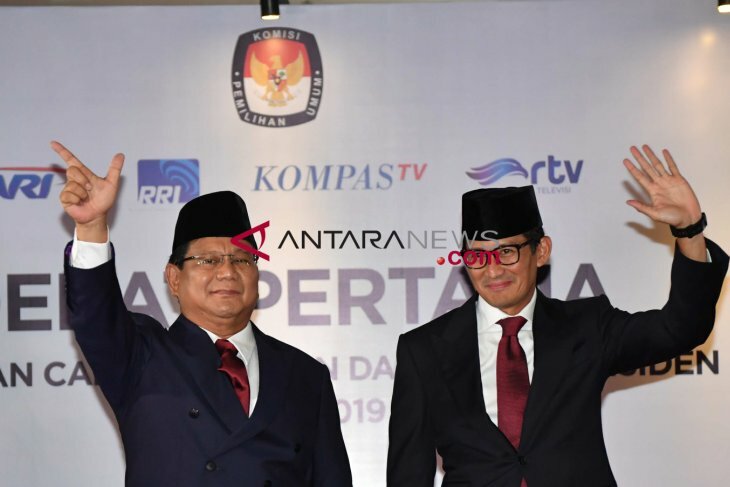 Bogor, W Java (ANTARA News) – Indonesian Presidential candidate Prabowo Subianto and his running mate, Sandiaga Uno, have pledged to make Indonesia the fifth biggest halal economy in the world if they win the upcoming presidential elections. This election promise was uttered by Sandiaga Uno, widely known as businessman-turned politician and former deputy Jakarta governor, when he spoke at the “Indonesia Triumphs` Initiative to be a Hub of the World`s Halal Economy” in Jakarta on Feb 2. His main reason for making Indonesia be one of the hubs of the world`s halal economy is related to its huge potency because its market is expected to reach around 1.8 billion Muslims across the globe. The potency of the global halal economy was estimated to reach around Rp3,300 trillion (US$1 = Rp14,143). Therefore, with a large Muslim population, Indonesia should be able to emerge as the hub of the world`s halal economy, Sandiaga Uno said. According to a report produced by the Dubai International Financial Center, with 1.8 billion Muslims all across the world, their spending was estimated at US$2.1 trillion in 2017. The report further reveals that globally, Muslim had spent an estimated $2.1 trillion in 2017 across lifestyle sectors, while the Islamic finance sector had $2.4 trillion in total assets. “Food and beverage leads Muslim spending by category at $1.3 trillion, followed by clothing and apparel at $270 billion, media and entertainment at $209 billion, travel at $177 billion, and spending on pharmaceuticals and cosmetics at $87 billion and $61 billion respectively,” it noted. Considering the above huge potency of the world`s halal economy, Malaysia has even leaped to lead this economic sector among countries in the Asia-Pacific region. As part of its endeavors to get greater accesses to the regional and global halal markets, the Malaysia Islamic Development Department (Jakim) formed the International Halal Authority Board (IHAB) last year. By establishing this Jakim`s IHAB, Malaysia is expected to be able to bring “greater global collaboration to halal certification in foodstuffs, non-food products and tourism” (Parker, 2018). In Mushtak Parker`s point of view, “Jakim`s IHAB initiative is an important manifestation of Malaysia Inc`s halal economy strategy going forward” (New Straits Times, April 13, 2018). This neighboring country`s strategy in getting greater benefits of this global halal market is implemented by facilitating its banking sector to play role in financing the US$6.4 trillion global halal economy. Maybank Islamic Bhd CEO Rafique Merican was quoted by Bloomberg as saying that his bank was expected to be able to open its first overseas branch in Dubai in 2019 to meet the demand for financing the global halal economy (The Star Online). Malaysia has been moving forward. Indonesia itself is also directed to the similar path to enable it to gain benefits of this huge global halal market. Sandiaga Uno has expressed his optimism that as the world`s largest Muslim country, Indonesia would become a hub of the world`s halal economy in several years from now if Indonesians could be the main players of the country`s halal industries. The halal industries are even being developed seriously in different parts of the globe, including in countries like Thailand, South Korea, and Japan, by considering the huge potency of the world`s halal economy. Attempting to convince his seriousness, Sandiaga Uno said he had discussed his plan to develop Indonesia`s halal economy if the Prabowo-Sandi pair won the elections, due to be held on April 17, 2019, with Irwandi Jaswir. “The potency of our country`s halal economy is so huge. It is not just related to its natural resources but also its human resources. Thus, we must be the key players and winners of the halal economy,” he said. Irwandi Jaswir is a leading figure in the halal economic field. He is an Indonesian, who has won the King Faisal International Prize for “Service to Islam” in 2018. “The target of Indonesia Triumphs is making Indonesia the world`s fifth halal economic power within five years, and the center of the world`s halal economy within 10 years. The sooner the better,” Sandiaga Uno said. At the moment, Indonesia is also viewed as being one of the countries in the Southeast Asian region that has been potentially selected to be a place for learning and cooperation. The Cambodian Government, for instance, is willing to learn from Indonesia`s experience in producing halal products amid growing demand for the halal economy. To this end, the Cambodian Government intends to send its selected citizens to join relevant training programs in Indonesia to gain knowledge on basic ways to produce and develop halal products, Indonesian Ambassador to Cambodia Sudirman Haseng stated. “I see the strong will of the Cambodian Government to be able to produce several halal products to support its exports to other countries, especially those in the Middle East,” he noted. Apart from sending its citizens to learn ways to produce halal products, this Buddhist-majority country also requires Indonesia`s assistance in basic infrastructure for preparing standard operating procedures, organization, and developing cooperation. If countries like Japan, South Korea, Thailand, and Cambodia, have been eyeing the huge potency of the global halal economy, Indonesia should be more serious in making itself become one of the key global players. « Opinion: How is Muslim beauty redefining the Asian cosmetic market?